The only thing remaining to be done at noon was the connection of the primary power cord, final checkout, and a calibration procedure that looked pretty simple. The kit had taken about 18 hours to complete, I estimated, without hurrying or cutting any corners. My father tells me that a kit of this complexity would have taken many months to build a few years back, and it would have ended up the size of a Mack truck. You can pack a lot of electronic circuitry in a single integrated circuit! The unit I put together is called the IB-101; it is a very compact and lightweight digital counter capable of reading frequencies from near dc to 15 MHz. And, according to the manual, the basic functions and uses of the instrument are like those found on the very highest priced frequency counters (needless to say, the Heath IB-101 is not high-priced). In general, the counter has the overall appearance of simplicity, despite the complex circuitry and number of features. (See Fig. 1.) Five cold-cathode display tubes, an "overrange" lamp, and two range indicator lamps make up the entire readout lineup. The accuracy of the readout is assured by a crystal-controlled digital clock. A high-impedance input circuit presents minimum loading to the -circuit you want to test, and automatic level triggering lets you make measurements without having to fiddle with controls and such. It's all pretty nice. The block diagram of Fig. 2 shows the operational arrangement. A feature I particularly like about the IB-101 is the simplicity with which it can be calibrated. If you don't happen to have an accurately calibrated frequency counter around to check the Heathkit against (and chances are you won't or you wouldn't have bothered to buy the Heath in the first place), all you really need is any old AM broadcast radio receiver. All you have to do is tune in a station on the BC set and hold it near the oscillator crystal in the counter. Then you just listen for a beat note on the radio and adjust the calibrate control (frequency adjusting trimmer) on the IB-101 for a zero beat. Fig. 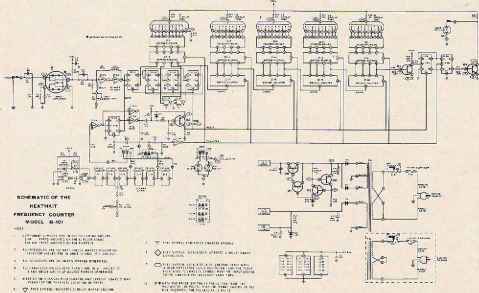 3, IB-101 schematic diagram. Even though there are only five digits readable on the counter, you are not restricted to reading out frequencies of that order. To count a frequency of 14.210450 MHz, for example, push the range switch on the counter to the kHz position and take a reading. The display will read 14210. Just keep this figure in mind and press the switch to the Hz position to read 10450. The overrange light will come on now to show that the frequency you're reading is actually higher than the Hz indication in fhe readout. Putting the two readings together gives the actual operating frequency: 14.210450. The schematic diagram of Fig. 3 shows what the IB-101 is made of. The input amplifier and Schmitt trigger circuits accept and shape the input signal into a square wave. Decade counters change these sequential input pulses into a binary coded 8-4-2-1 output and recycle on every tenth input pulse. The four bits of binary coded information are then connected to the buffer/storage units which accept and store the count data on command of the transfer signal. 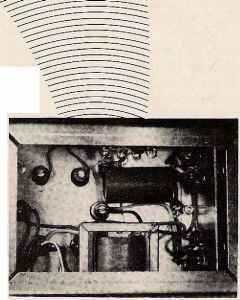 The decoder drivers translate the binary coded information from the buffer/ storage units into decimal form and drive the proper display tube cathodes. Timing signals for gating, transfer, and reset are generated in the clock and divider chain. It's all quite neat, you'll have to admit. My advice to builders of this useful little instrument would only be to follow these simple suggestions: Before starting to assemble the kit, be sure you know all there is to know about soldering and wiring. If you don't, you'd better break down and read the "kit-builders's guide" that accompanies the kit. Because of the very small circuit-board space between some of the printed conductor material, you have to be extremely careful to prevent solder bridges.' Play ij: cool and don't try to use a big gun or eighth-inch-diameter solder! Use the minimum amount of solder required to get the job done and use heat sparingly. You'll really need a tiny tip on your iron to do the job right; and Heath recommends using an iron of not more than 25W. Fig. 4. Poor man's low-wattage iron: Wrap a piece of 12- or 14-gage solid copper wire around the tip of your regular iron, letting the wire end protrude a half inch or so. File the end of the wire to shape. job. Who knows — you might want to build another kit one day, then at least you'd be prepared in advance. The counter is accurate — or at least it seems to be. Like all counters, the inherent error is plus or minus one digit in the least significant column (regardless of range) — and you could hardly kick about that. Mr. Green is using the counter I built to check against the dial on his National NCX-1000. And he tells me that the National dial and the Heath counter agree consistently. All of which says a great deal for the National transceiver, too.